Our summers can be hot, hot, hot! What better way to cool off than with a smoothie using fresh, local ingredients? It’s an easy, wholesome way to soak up nutritious fruits and vegetables. With farmers markets popping up everywhere, there’s a wide variety of ingredients from which to choose, such as cherries, blueberries, lettuce, cucumber, celery and pears. You can check Foodland Ontario’s online availability guide to see what’s in season. Bananas, blueberries and pineapple are perfect in smoothies. They add natural sweetness and a variety of nutrients such as potassium, vitamin C, digestive enzymes, antioxidants and fiber. Even though fruit is a healthy choice, make sure to only add one or two portions, as it’s also high in sugar. Not all fats are created equal. 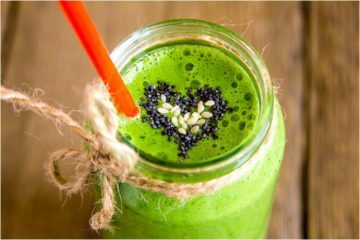 Chia seeds, hemp seeds, flax seeds, avocado and coconut oil are all examples of healthy fats that are delicious additions to any smoothie. Adding healthy fats to your mix makes it more filling so you feel satisfied longer. Many smoothies include whey protein powder, which is usually high in sugar and calories. Make sure to choose a dairy, sugar and soy-free protein powder for your smoothie. I recommend Genuine Health Fermented Vegan Proteins+ and Vega Protein and Greens. Both are made with vegetarian protein from peas, brown rice, quinoa and hemp, have added nutrients from sprouts, spirulina and greens, and are naturally sweetened with stevia. You’ve got your fruit in there, your healthy fats, your vegetarian protein; now it’s time for the most important ingredients: vegetables. Fill the rest of your blender with organic baby spinach, kale, cucumber, celery—whatever you like; just make sure it’s green. Green veggies are low in calories and amazing for healthy digestion. They have cancer-fighting properties, they’re high in fiber, vitamins and essential minerals, and they’re also good sources of iron, which helps combat fatigue. 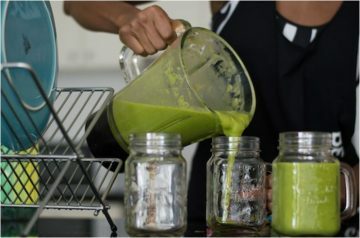 In order to make a healthy smoothie you need to know that your blender will take down anything you throw at it, such as whole beets, celery stalks or carrots, and blend them into a smooth, creamy, delicious beverage. (No one wants to find chunks of unblended vegetables in a morning smoothie.) Think of buying a high quality blender like a Vitamix or Blendtec as an investment in your health. The great thing about smoothies is there are lots of options. To give you some ideas, here’s the recipe for my go-to morning drink. Add all ingredients to a high-powered blender (I use a Vitamix), and blend until smooth. Time-saving tip: add banana, spinach, seeds, and coconut oil to your blender the night before. In the morning, add frozen pineapple, liquids and protein powder. Blend and pour into your drink bottle, screw on the lid and voila: you have a healthful breakfast to go.